On February 20, 2018 Baroness Miller of Chilthorne Domer presented a "Question for Short Debate" in the House of Lords, Parliament of the United Kingdom: "To ask Her Majesty’s Government what is their assessment of the outcome of the United Nations Conference to Negotiate a Legally Binding Instrument to Prohibit Nuclear Weapons, Leading to Their Total Elimination." The July 7, 2017 joint statement by France, the United Kingdom and the United States clearly stated that they "do not intend to sign, ratify or ever become party to" the Treaty on the Prohibition of Nuclear Weapons that was passed by a majority of nations that same day. The Treaty on the Prohibition of Nuclear Weapons, or the Nuclear Weapon Ban Treaty, is the first legally binding international agreement to comprehensively prohibit nuclear weapons, with the goal of leading towards their total elimination. It is unconscionable that any nation claiming to uphold the rule of international law and the United Nations Charter would refuse to support one of the most important treaties in modern history. The only attempts at something resembling debate (about nuclear weapons) in the U.S. Congress have been recent concerns about the President's authority to order the launch of nuclear weapons, and the recently released Nuclear Posture Review will hopefully generate some useful debate. However, members of Congress are mostly mute about the U.S. signing the Ban Treaty. Click here to read all the contributions to the debate surrounding Lord Domer's question. My Lords, I declare an interest as a co-president of Parliamentarians for Nuclear Non-Proliferation and Disarmament. I thank all noble Lords who will contribute their considerable expertise this evening. Many noble Lords taking part in this debate will have spoken in the debate in 2013 that the noble Lord, Lord Ramsbotham, introduced, which was really the last substantial debate that we had on the issue generally. “margin for error in avoiding disaster is getting thinner because of the introduction of new, smaller weapons, the broadening of circumstances in which their use is being contemplated, and a lack of high-level communications between major nuclear weapons powers”. “higher than it’s been since the Cuban missile crisis”. His words are, rightly, chilling. That increased threat was one of the factors that led to the Treaty on the Prohibition of Nuclear Weapons, which is about to become international law. It was voted for by 122 countries, with one against, and some abstentions—of course, all nuclear weapon states abstained. The treaty, widely known as the ban treaty, will become international law when 50 states have signed and ratified it. The ban treaty prohibits states parties from developing, testing, producing manufacturing, otherwise acquiring, possessing, stockpiling, transferring, using or threatening to use nuclear weapons, so it is pretty comprehensive. The International Campaign to Abolish Nuclear Weapons, known as ICAN, won the Nobel Peace Prize last year for its work on the ban treaty. The treaty results from the frustration of the vast majority of countries of the world with the few nuclear weapon states, which have completely failed to honour Article 6 of the nuclear non-proliferation treaty. Noble Lords will know that Article 6 requires that nuclear weapons states make meaningful steps towards nuclear disarmament. In return, other countries agreed not to develop nuclear weapons. It is 50 years since that agreement was signed and, although there have been steps to limit the number of nuclear weapons, there has not been the disarmament envisaged by Article 6. “The UK is not attending the Open Ended Working Group … on nuclear disarmament in Geneva …The Government believes that productive results can only be ensured through a consensus-based approach that takes into account the wider global security environment”. But how can consensus ever be reached when those with nuclear weapons will not even attend meetings to debate the issues? “if a nuclear conflict happened today, there is no humanitarian assistance capacity that could adequately respond to such a catastrophe”. Of course, beside the appalling immediate deaths, the world would face the much wider threat of a prolonged nuclear winter. Nuclear weapons are now the only weapons of mass destruction that are not subject to a categorical ban. Chemical and biological weapons are rightly banned, but nuclear weapons, the most apocalyptic WMDs, remain legally acceptable. Now the ban treaty fills a major gap in international law and will change that. “isn’t deterrence—it’s an invitation for America’s adversaries to expand and diversify their nuclear arsenals too”. The accuracy of his quote is echoed in the Chinese PLA Daily, which responded to the new American posture by saying that China needs more nuclear warheads to deter the US threat. Just this month the news is bad. Russia is reported to be deploying nuclear weapons on the borders of Poland and Lithuania. The US Director of National Intelligence, Dan Coats, said that Pakistan is developing new types of nuclear weapons, including short-range tactical ones, which will bring more risks to the region. 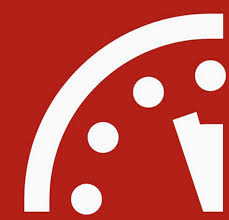 All of this has led atomic scientists to move the Doomsday Clock forward to two minutes to midnight. The situation is extremely urgent. In the light of that, the UK must become a much more positive influence for progress, just as it did on climate change when we were the first country to introduce a climate change Act with mandatory targets. This example was crucial to getting the final Paris accords. I am asking the UK Government to stop boycotting global efforts to even discuss this massive issue and take an active part. I am sure that other noble Lords will mention some of the positive moves that can be built on: the Iran deal—held to be a success despite President Trump’s attempts to sabotage ​it—and the resumption of the NPT review cycle, with a preparatory committee this May hopefully leading to a reinvigorated NPT. I ask that the UK should play a constructive part in the forthcoming UN high-level conference on nuclear disarmament. This conference could make all the difference. It could set the scene for immediate steps in changing policy, such as no first use and de-alerting, before moving the agenda on to longer-term issues of a phased programme to reduce nuclear stockpiles. Will the Minister confirm that the UK will take part in the conference, to be held in New York in May? We have plenty to offer. The UK has done some valuable work on verification; Aldermaston could be a global centre of excellence in nuclear disarmament. We also owe participation to our NATO partners. Having asked them to oppose the ban treaty process, it is now time for nuclear weapon states to provide something in return: a commitment that we are willing to engage with serious nuclear disarmament initiatives. There is a clear choice. Although this serious subject is not really the time for a joke, this one does illustrate the stupidity of the situation we have got ourselves into. There are two aliens, and the first one says, “The dominant life forms on planet Earth have developed satellite-based nuclear weapons”. The second alien asks, “Are they an emerging intelligence”? The first alien says, “I don’t think so; they have them aimed at themselves”. We have the nuclear weapons aimed at ourselves as mankind. It is time that we made a choice to start on the road to disarmament. It will be a long and difficult road, but we have to start talking. We have to attend the UN high-level conference in New York and I hope that the Minister will have a positive message about that for this House this evening. Syrian Airstrike; What If? Unmasking the Fatal Flaw of Deterrence! Editor's Note: This commentary on yesterday's U.S. air strike on Syria was written by Ralph Hutchison, Coordinator of the Oak Ridge Peace Alliance. It provides a much more thoughtful and broader perspective on the event and its existential ramifications than you will find in the mainstream, corporate media. Trump orders airstrike on Syria. What If? There was little warning. That is the nature of a surprise attack. Still, the reality that our country has carried out an act of war against another country is shocking. Knowing that our historic nuclear-armed nemesis is on the other side, on the ground in that country quickly turned my shock into a heavy dread. There are many reasons for Russia to stand aside in response to the US attack on a Syrian airbase after Donald Trump was affected by scenes of children who had been murdered by chemical weapons. There are also reasons for Russia to express concerns about a US President deciding to become the global enforcer of UN conventions without waiting for a greenlight from the security council or anyone else—what seems swift and decisive to President Trump could seem abrupt and impetuous to someone else. And there could be reasons for Russia to take it personally—if Russian personnel were on the ground at the airbase and were killed in the attack, for instance. The US President will receive accolades or condemnations from members of Congress and others who agree or disagree with his action. He declared his order to strike the airbase was based on the US’s “vital national security interest” in preventing the spread of chemical weapons. Pundits did not blink an eye; we have grown accustomed to defending any action we deign to take by invoking our vital national interest. In this case, no US citizens or military personnel were harmed by Assad’s horrific attack; no US corporate or government properties were at risk. If the US at this moment now holds UN conventions sacred, one can only hope we apply that same solemn obeisance to the Land Mines Convention and, when it enters into force, the Treaty to Ban Nuclear Weapons. But the hard looming question of this night is this: What if Russia decides to test the mettle of Donald Trump and the divided United States by countering with firepower in a limited strike? What if Russian personnel were killed in the attack, and Vladimir Putin’s pride requires a concomitant response? That What If has numbed me this night. That What If is unspeakable on Talk-TV tonight. Could one or the other, feeling tested, decide to put any questions to rest by reaching for the nuclear codes? We pray that would never happen, of course. We pray for our lives, and the lives of future generations. We pray whether or not we believe in God or a god or goddess. But we cannot pray that it could never happen, and therein lies our deepest problem and the unmasking of the fundamental, fatal flaw in the concept of nuclear deterrence. It could happen. And the fact that all we can do about it at this moment is pray should motivate every woman, man and child in the country to take up the cause of nuclear disarmament. We don’t all have to be on the same page, we don’t all have to agree on the nuts and bolts or the schedule. We also don’t all have to sit back and say it can’t be done, because it can. Hundreds of millions of people around the world believe it can. One hundred twenty-three nations that convened last week at the United Nations to discuss a treaty to ban nuclear weapons believe that it can. History says that it can—several countries that once possessed nuclear weapons no longer have stockpiles or manufacturing capabilities. Other countries that could produce their own nuclear weapons have chosen not to. Only three things are lacking, and they are connected. One is political will translated into political power—the people, when asked directly, express by large majorities the desire to live in a world free of nuclear weapons. The second thing lacking is courage to embrace a power greater than our fears. And the third thing is the liberation of our governing officials in the House and Senate from the golden chains of the nuclear weapons institutions—the corporations and weapons communities and federal agencies that drain the national coffers to build weapons of mass destruction. Tonight, as we wait to see how Russia might respond and what will happen as this chess game plays out with pieces bathed in blood, we must confront the terrible truth of the times we live in: decisions made by these few men could end us all in one afternoon. Tomorrow afternoon, or the one after that, before we can even reach our children to hug them to our chests. If that is not acceptable to you, find a group working for the abolition of nuclear weapons—not talking about it, but working for it—and throw yourself behind them. If you belong to such a group already, double down. If you can’t find a group, start one. Nothing is more important. Editor's Note: The United Nations, on March 27th, began historic negotiations intended to lead to a global nuclear weapons ban treaty. The United States, along with the other nuclear-armed nations and some other nations, boycotted the negotiations. This commentary by Ramesh Thakur, just published in The Japan Times, provides an important perspective and context on the negotiations and their importance on the road to abolishing the threat posed by nuclear weapons. We may be at an inflection point in global affairs with the world in disarray with a volatile, erratic and unpredictable administration in Washington, imminent British and possibly French exits from the European Union, presidential instability in South Korea and the like. One of the strong political headwinds creating international turbulence is intensifying nuclear threats. On March 27, 115 countries gathered at a U.N. conference in New York to negotiate a treaty to ban nuclear weapons. Arguing that “it would be difficult for Japan to participate … in a constructive manner and in good faith,” Japan, having delivered its opening statement sharply critical of the conference, walked out. 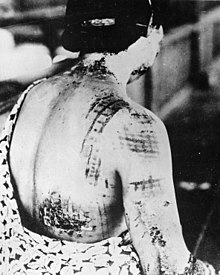 The hibakusha — survivors of the 1945 U.S. atomic bombings of Hiroshima and Nagasaki — saw the first-ever U.N. talks on a ban treaty as a practical and important step toward pursuing a world free of nuclear weapons and expressed criticism and disappointment at Tokyo’s decision. The nine countries with nuclear weapons — China, France, India, Israel, North Korea, Pakistan, Russia, the United Kingdom and the United States — refused to attend at all. In an unusual move, to say the least, Washington’s U.N. Ambassador Nikki Haley was joined by delegates from about 20 countries in an anti-treaty protest rally outside the General Assembly hall. Yet the Conference on Disarmament has been deadlocked for many years, unable to agree even on a program of work let alone discuss such concrete issues as a fissile material cutoff treaty and the prevention of an arms race in outer space. This is disingenuous and self-serving. The deep division in the international community exists between the 110-130 countries pursuing ban negotiations in good faith and the 40-odd group of nuclear armed states and allies who have been resisting and obstructing their efforts. There are two routes to reconciling the two groups. One is for the nonnuclear states to embrace nuclear weapons and join the possessor countries with their own bombs. The alternative is for the nuclear powers and the umbrella states to engage with the international community in the pursuit of nuclear disarmament. The latter goal has five components. Three of these can be pursued only by those who possess the bomb: cap, reduce and eliminate. The Asian nuclear powers — China, India, Pakistan and North Korea — are expanding their weapons stockpiles and diversifying their land, air and sea-based delivery platforms. All nuclear powers are modernizing and upgrading their arsenals. Pyongyang is the only one still testing nuclear devices. Such developments could be frozen. Russia and the U.S., with over 90 percent of nuclear stockpiles, could negotiate substantial cutbacks to reduce warhead numbers to a few hundred instead of several thousand each. They could also reduce reliance on high-risk doctrines, postures and deployment practices like launch-on-warning and first use of nuclear weapons. Finally, following an eventual universal nuclear weapons convention, they could proceed to verifiable and enforceable elimination spread over more than a decade to ensure decommissioning, dismantlement and destruction of weapons and weapons-producing materials and infrastructure are carried out safely and securely. The remaining two items on the agenda — stigmatization and prohibition — can be pursued by the nonnuclear weapon states and this is the primary purpose of the U.N. conference. A treaty coming from the conference will not reduce a single warhead from the global nuclear stockpiles. But it will harden the normative boundaries between conventional and nuclear, regional and global, and tactical and strategic weapons that are being blurred by technological developments. There has also been a growing convergence between cyber, space and nuclear domains, further multiplying nuclear risks and dangers. Over 2,000 scientists, recalling U.S. President Ronald Reagan’s belief that a nuclear war cannot be won and must never be fought, have signed an open letter supporting the U.N. talks. Even the 2016 NATO document conceded that “The effects of a nuclear weapons ban treaty could be wide-ranging.” Several of these were spelled out in the document. In other words, U.S. opposition is built fundamentally not on the lack of practical effects of a ban treaty, but on the opposite: its very considerable impact in the real world. Indeed the strength of their opposition is difficult to fathom but for this recognition of the practical import of a ban treaty. Advocates of the ban negotiations believe that the world needs to be made safe from nuclear weapons through their stigmatization, reduction, prohibition and verified elimination. Opponents of the negotiations insist that instead the world should first be made safe for nuclear disarmament to happen. In effect they seem to believe that negotiations on banning nuclear weapons should begin only after nuclear weapons no longer exist. It is time for the so-called realists to get real about the existential dangers of a world brimming with nuclear weapons and the urgent need to stigmatize, prohibit and eliminate them. 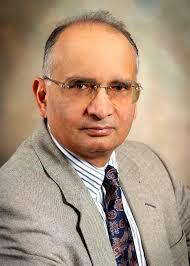 Professor Ramesh Thakur is director of the Center for Nuclear Non-Proliferation and Disarmament, Australian National University. Remembering Castle Bravo: Time for a Ban Treaty! On March 1, 1954 the United States tested the first deliverable hydrogen bomb, code named "Bravo”, at Bikini Atoll, in the Marshall Islands. Bravo was the largest U.S. nuclear test ever exploded, with a yield of 15 megatons, 1000 times larger than the bomb dropped on Hiroshima (and well beyond the predicted yield of 6 megatons). It blasted a crater 1.2 miles in diameter into the atoll. Castle Bravo was supposed to be a secret test, but because its designers underestimated its yield, things went dreadfully wrong in a flash. Because of the fission products, huge yield and shifting winds, radioactive fallout from the cloud spread quickly and far, contaminating over seven thousand square miles of surrounding ocean and nearby inhabited islands including Rongerik and Rongelap. The flash could be clearly seen 250 miles away (some secret!). Radioactive fallout from the test affected U.S. service personnel on ships, natives of Rongelap Island, 100 miles from the test, Utrick Island, 300 miles away, and fishermen on a Japanese vessel, the Daigo Fukuryu Maru, or Lucky Dragon. The crew were fishing outside of the U.S. declared exclusion zone when Castle Bravo detonated. The ship was covered in fine radioactive ash soon after the explosion. By the time the ship returned to Japan all 23 crew members suffered from the effects of acute radiation syndrome - including nausea, headache, burns, pains in the eyes, and bleeding from the gums - and were admitted to hospitals. I pray that I am the last victim of an atomic or hydrogen bomb. Several hundred other fishing vessels and their crews were also exposed to the fallout from Castle Bravo. of radiation; although short term effects were mild, long term effects were significant for many. 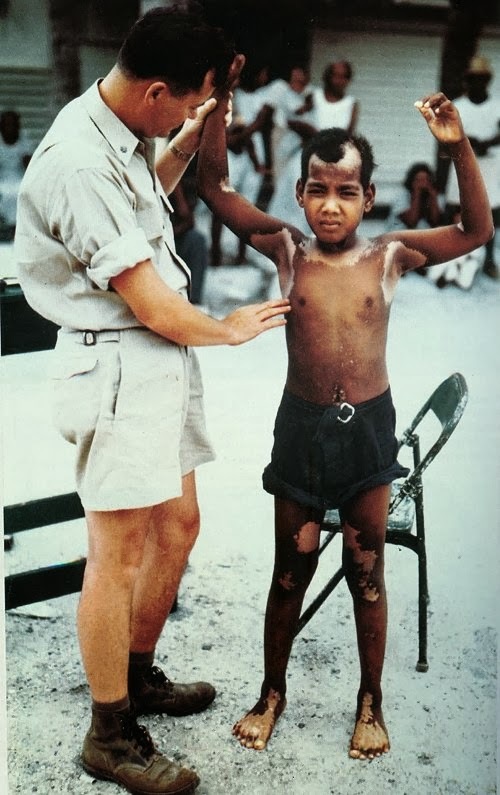 90% of the Marshall Islands' population experienced thyroid tumors. The Marshall Islanders and their lands were essentially involuntary test subjects in the U.S. governments nuclear testing, as were U.S. service personnel. The U.S. continued atmospheric nuclear testing around the Marshall Islands, conducting 67 tests at Bikini and Enewetak atolls between 1946 and 1958 leaving a legacy of contamination and death. 840 Marshall islanders are believed to have died from health problems caused by the tests. As of the end of 2003, more than 1,000 islanders were suffering from symptoms believed related to radiation exposure. 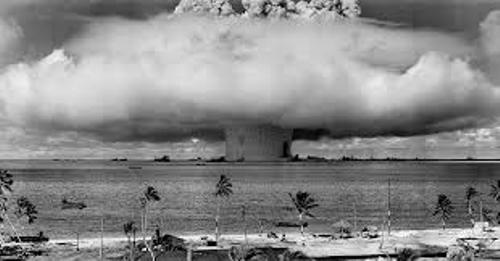 In 1956, the United States Atomic Energy Commission called the Marshall Islands “by far the most contaminated place in the world.” Today (63 years later) the Marshall Islands are still contaminated, and radioactive cesium is found in water and fruits. Back in the early 1970s the U.S. government declared Bikini safe for resettlement, and some residents returned. They were removed once again in 1978 after it was discovered that they had ingested high levels of radioisotopes from eating foods grown on the former nuclear test site. 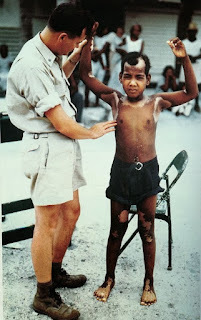 Residents of Rongelap Atoll underwent similar indignities. The U.S. has been derelict in failing to protect the health and welfare of the Marshall Islanders and their lands, and has failed to recognize their suffering and adequately compensate them. The Marshall Islands have tried to bring the greater issue to the attention of the world. Among their strategies has been to file a lawsuit against the U.S., and eight other nuclear powers, in U.S. District Court, alleging that the U.S., as occupying superpower, has continued to modernize its nuclear arsenal in defiance of Article VI of the Treaty for the Non-Proliferation of Nuclear Weapons (NPT). Whatever the legal outcome of such actions, it should be clear that the United States has no moral standing on this issue. The continued pursuit of nuclear weapons and the threat of their use against other nations constitute crimes against humanity. The Cold War is a distant memory (although a new Cold War is brewing); and yet the United States and Russia still maintain thousands of nuclear missiles ready to launch on warning. The President of the United States may have just a few minutes to make the fateful decision to launch nuclear weapons in case of warning of a nuclear attack. In 1995, Russia came within a few minutes of launching a nuclear counterattack after it initially interpreted the launch of a scientific rocket from Norway as a first strike. This is just one close call among many documented incidents involving both the United States and the Soviet Union/Russia. A number of them have been just too close. The Bush administration repeatedly refused to pledge to a "no first use" policy regarding the use of nuclear weapons. President Obama never explicitly stated a "no first use" policy. And now we have a president who has stated that "we're going to be at the top of the pack" when it comes to nuclear weapons. He most likely doesn't even understand what "first use" even means, let alone the existential implications of using nuclear weapons. Looking forward we should remember those last words of Aikichi Kuboyama before he died of radiation poisoning. We must work to remove the nuclear sword of Damocles hanging over humanity. If we fail in this task, we will have failed Kuboyama and all who have suffered from the effects of nuclear weapons. Support the upcoming United Nations Nuclear Ban Treaty Negotiations beginning this month. Learn more at the International Campaign to Abolish Nuclear Weapons. Divestment works! The divestment campaign mounted in the 1980s in protest of South Africa's apartheid system pressured the South African Government to begin negotiations ultimately leading to the dismantling of the Apartheid system. Today we have a 70-year legacy of building and maintaining nuclear weapons that has benefited only the companies that have built and maintained them, along with the companies and organizations (and individuals) that have invested in them. 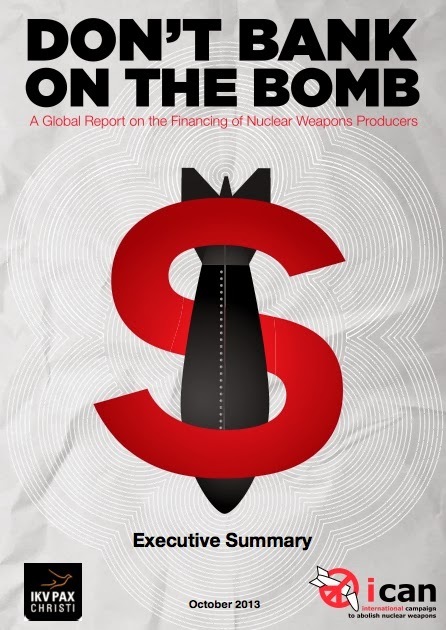 The newest Don't Bank on the Bomb report, from the Dutch organization PAX, identifies 390 banks, insurance companies and pension funds that still invest in nuclear weapon producing companies. Since 2013, these companies have made nearly half a trillion dollars available to companies involved in the production of nuclear weapons. The vast majority of governments in the United Nations recently voted to negotiate a nuclear weapons ban treaty in 2017, and it is high time for financial institutions to make the moral/ethical decision to stop investing in companies involved with nuclear weapons. Currently, eighteen financial institutions, managing more than $1.8 trillion, prohibit investments in nuclear weapons producers. These institutions are prepared for the legal implications of a ban on nuclear weapons to be negotiated at the UN in 2017. Another 36 institutions have some form of limitation on such investments. But far too many institutions are still investing in nuclear weapons producers, according to the Don’t Bank on the Bomb report. Don't Bank on the Bomb tells us what companies are working on nuclear weapons, who is investing in them (the Hall of Shame), and most importantly - who is not (the Hall of Fame). With this information we, as both individuals and organizations, can make informed decisions about our investments. As clients and investors we can pressure the banks, pension funds and insurance companies to divest and reinvest in a responsible way. This is just one important way we can bring about the abolition of nuclear weapons. Read the Don't Bank on the Bomb report and share it widely. Then we can all put our hard-earned money to work for peace. I am currently focusing my energy on the Ground Zero Center website and Take Action page. Please check it out and get involved for a nuclear weapon-free world! Experience the power of a nuclear weapon. Click the photo to learn what would happen if a nuclear weapon detonated over your city. Check out the most recent edition and learn where to NOT invest your money! No Nuclear "fire and fury" Ever Again! Preventing the Unthinkable!